The fall in European potential output growth over the past 20 years illustrates both the structural barriers to productivity growth and the scope for policy to break them down. Recent research has linked the productivity slowdown to widening productivity dispersion across firms (Andrews et al. 2016), rising capital misallocation (Gopinath et al. 2017) and declining business dynamism (Decker et al. 2016). Zombie firms – firms that would exit or restructure in a competitive market – are a related source of concern, because they potentially crowd out growth opportunities for more productive firms (Figure 1). Note: Firms aged ≥10 years and with an interest coverage ratio <1 over three consecutive years. Capital stock and employment refer to the share of capital and labour sunk in zombie firms. The sample excludes firms that are larger than 100 times the 99th percentile of the size distribution in terms of capital stock or number of employees. Source: Adalet McGowan et al. (2018), based on ORBIS data. We have explored one potential source of the rise of zombie firms – the tendency for weak banks to evergreen loans to zombie firms to avoid realising losses on their balance sheet (Andrews and Petroulakis 2019). Not much is known about this topic, except for the Japanese experience of the 1990s (Caballero et al. 2008). We provide new cross-country evidence on the connection between zombie firms, bank health, and insolvency frameworks, and the consequences for productivity growth. Using ORBIS – a large cross-country firm-level database – linked with micro bank and credit data, we found four concrete results. After controlling for cyclical influences at the industry-country level, our estimates imply that weak banks are between 1.2 and 1.8 percentage points more likely to be connected to a zombie firm than healthy banks (Figure 2). Note: Zombies defined as firms aged ≥10 years and with an interest coverage ratio<1 over three consecutive years. The zombie share by bank refers to the share of firms linked with each bank and classified as zombies. The bank health index is the first principal component from a principal component analysis using seven key balance sheet and income statement indicators. 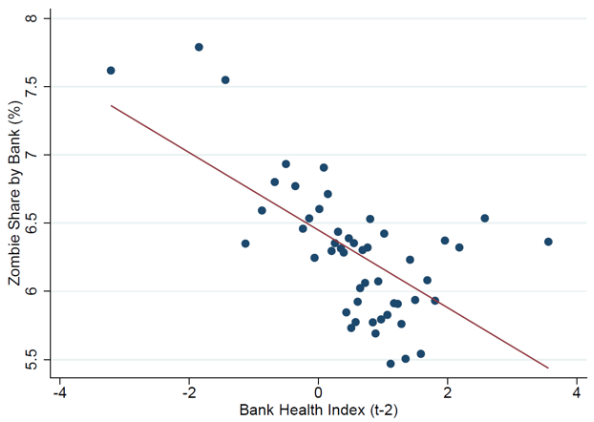 This translates into a 13% to 19% difference in zombie incidence between healthy and weak banks, relative to the mean. These results are consistent with the idea that Europe's zombie problem may, at least partly, be due to bank forbearance. Even when banks are healthy, an insolvency framework which creates impediments to corporate restructuring and reduces recovery rates may reduce the incentive for banks to start their recovery, liquidation, or restructuring process. New OECD insolvency regime indicators (Adalet McGowan and Andrews 2018) show that improvements in bank health are associated with relatively fewer zombie firms in countries in which insolvency regimes do not inhibit corporate restructuring. For example, if Estonia – where barriers to corporate restructuring are high – reformed its insolvency regime to best practices (i.e. those of the UK), then the reduction in the zombie firm share associated with a one standard deviation improvement in bank health would be around 1.3 percentage points higher. These gains are significant, given that the zombie firm share averaged around 5% across OECD countries in 2013. In other words, bank-strengthening efforts complement insolvency regime reform. In a well-functioning economy, capital should flow towards more productive firms at the expense of less productive ones. Consistent with Adalet McGowan et al. (2018), we show that, on average, capital reallocation is productivity-enhancing, but the extent to which this is true diminishes as zombie congestion (the share of the industry capital stock sunk in zombie firms) rises. Consistent with the link between zombie firms and bank health, we then show that the capital reallocation process is less productivity-enhancing in industries exposed to weaker banks. Our results suggest that around one-third of the impact of zombie congestion on capital misallocation can be directly attributed to bank health. These findings are significant given that capital misallocation is emerging as a key explanation of the productivity slowdown in some countries (Gopinath et al. 2017). If the zombie-congestion hypothesis holds, one would expect that this relationship is also reflected in access to credit. Using survey data on credit availability, we find a statistically significant negative relationship at the sectoral level between zombie congestion and credit availability for healthy firms. This could reflect direct crowding-out (weak banks due to zombie exposure) or reduced borrowing capacity because zombie congestion has reduced industry profitability, and therefore returns on potential projects. Assuming banks engage in sectoral diversification, the latter effect is more likely. These results should be interpreted with caution, however, given that the sample size is small, and the economic magnitude of the estimated coefficient is modest. Borio (2018) and White (2012), among others, argue that 'too low for too long' policies have fuelled the survival of weak firms, increasing misallocation and harming productivity growth. On the other hand, Obstfeld and Duval (2018) and others have argued that monetary accommodation facilitated access to credit for viable but vulnerable firms, and allowed them to finance working capital and invest, alleviating an even larger drop in aggregate demand and productivity. Unlike in 1990s Japan, new lending to weak and indebted firms is probably unlikely, owing to modern supervisory practices. Instead, banks could allow forbearance on the stock of existing debt, to help firms alleviate payment problems. Since monetary policy influences the flow of credit, future research linking zombie firms to monetary policy via forbearance should search for more nuanced channels. And while it is possible that the incentive for forbearance is higher in low interest rate environments, large rate rises may be required to alter these incentives. This may imply levels higher than the optimal rate. What is clear is that effective insolvency regimes reduce the costs of recognition at any level of the policy rate. Nevertheless, this debate should not distract from the contribution of bank recapitalisation and insolvency regimes. Our results imply that that banks must be healthy in order to facilitate the unwinding of the zombie problem. In this context, fast recapitalisations after crises, and measures to reduce NPLs, are important. But strengthening banks is insufficient if insolvency regimes are hostile to the orderly restructuring and resolution of weak firms. Thus, efforts to improve bank health should be accompanied by insolvency reforms that reduce impediments to corporate restructuring. And countries with strong banks should view an effective insolvency framework as a measure that enhances financial stability. Adalet McGowan, M and D Andrews (2018), "Design of insolvency regimes across countries", OECD Economics Department working paper 1504. Adalet McGowan, M, D Andrews, and V Millot (2018), "The Walking Dead? Zombie Firms and Productivity Performance in OECD Countries", Economic Policy 33(96): 685–736. Andrews, D and F Petroulakis (2019), "Breaking the Shackles: Zombie Firms, Weak Banks and Depressed Restructuring in Europe", ECB working paper 2240. Borio, C (2018), "A blind spot in today’s macroeconomics? ", Panel remarks in BIS-IMF-OECD Joint Conference on Weak productivity: the role of financial factors and policies. Caballero, R, T Hoshi, and A Kashyap (2008), "Zombie Lending and Depressed Restructuring in Japan", American Economic Review 98(5): 1943–1977. Decker, R, J Haltiwanger, R S Jarmin, and J Miranda (2016), "Changing Business Dynamism and Productivity: Shocks vs. Responsiveness", NBER working paper 24236. Gopinath, G, S Kalemli-Ozcan, L Karabarbounis, and C Villegas-Sanchez (2017), "Capital Allocation and Productivity in South Europe", Quarterly Journal of Economics 132(4): 1915–1967. Obstfeld, M and R Duval (2018), "Tight monetary policy is not the answer to weak productivity growth", VoxEU.org, 10 January. White, W (2012), "Ultra-Easy Monetary Policy and the Law of Unintended Consequences", Federal Reserve Bank of Dallas Globalization and Monetary Policy Institute working paper 126.